Nationwide, more than 5 million teachers will be needed over the next decade, and all must take appropriate tests to be licensed. REA gets you ready for your teaching career with our outstanding library of Teacher Certification test preps. 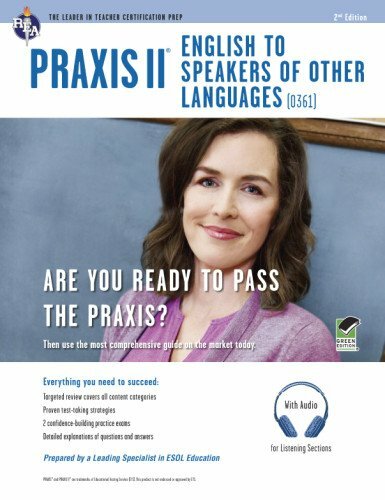 Our PRAXIS II test prep is designed to help teacher candidates master the information on the English to Speakers of Other Languages (0361) exam. It’s perfect for college students, teachers, and career-changing professionals who are looking to become ESOL teachers. The book includes two full-length practice exams based on actual Praxis questions. Each practice test is balanced to include every type of question, subject area, and skill tested on the exam. Our practice tests replicate the Praxis question format, allowing you to assess your skills and gauge your test-readiness. An audio component featuring recordings of non-native speakers and a series of questions that replicate the actual exam is available online. Both tests come with instant scoring, diagnostic feedback, and detailed explanations of answers. We don’t just say which answers are right—we explain why the other answer choices are wrong—so you'll be prepared on test day. Our detailed answers help you identify your strengths and weaknesses while building your skills. This test prep is a must-have for anyone who wants to become an ESOL teacher! By Target Training International, Ltd.